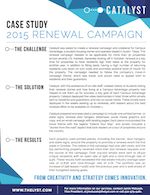 Catalyst was asked to create a renewal campaign and collateral for Campus Advantage, a student housing owner and operator based in Austin, Texas. This renewal campaign needed to be applicable for more than 30 properties across several U.S. markets. Generally kicking off in October, renewal is a key time for properties to have residents sign their lease at the property for another year. In addition to filling beds, having a high number of returning residents cuts down on turn costs and promotes positive word of mouth for the property. The campaign needed to follow the company’s move-in campaign theme, which was travel, and would need to appeal both to residents and their guarantors. Catalyst, with the assistance of on-site staff, created videos of students telling their renewal stories and how living at a Campus Advantage property had helped to set them up for success, a key goal of each Campus Advantage property. Catalyst deployed five video testimonials in total: three within emails sent to residents and guarantors, and two on social media. These emails were deployed in the weeks leading up to renewals, with teasers about the best renewal offers to be available on October 1, 2015. Catalyst prepared and executed a campaign to include one printed banner, 10 stake signs, renewal door hangers, letterhead, social media graphics and copy, and an email campaign with landing pages. Each piece incorporated the travel theme with the tagline “Extend Your Stay”, and emails included a “stories from the road” aspect that took readers on a tour of properties around the country. Each property used printed pieces, including the banner, door hangers, and stake signs, around the property to promote a renewal event the first week in October. The videos in the campaign had over 580 views, and the top performing property received more than 200 renewal requests over the course of the campaign. Over 104,000 emails were sent to 28,531 unique recipients with an open rate of 59% and a click-through rate of 9.9%. These results both exceeded the real estate industry average open rate of 21.83% and click-through rate of 2.1%. The portfolio saw an increase of 296 leases (+124%) over the previous year and is well ahead of their budgeted leasing goals.